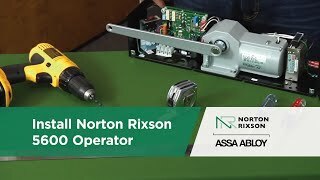 The Norton ADAEZ PRO Complete 5845xSQPB heavy-duty low energy compact door operator kit for push or pull side mounting. Use either as wire free Regenerative Drive Operation for high traffic manual opening applications that occasionally require automatic operation OR hardwired for high traffic applications that require continuous duty. With two RF wireless square push buttons for automatic operation. The Norton 6300 Series slim profile Low Energy Operator offers a broad set of intelligent functions, such as latch boost, latch retraction and obstruction detection to safely secure a variety of moderate to high traffic openings. This Norton 5610 Electromechanical low energy door operator is ADA compliant and is ideal for use in touch-free applications. Standard supplied with a track assembly. The pull-side mounted unit can be operated manually or activated by wall switches, or radio frequency devices. 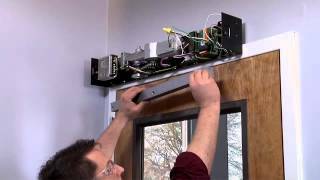 The Norton 5630 Leo Electromechanical low energy door operator is ideal for retrofit applications, the 5600 series converts interior, non-fire rated doors for ADA compliance easily and provides a simple way to achieve touchless environments. Standard with a track assembly, the push-side mounted unit can be operated manually or activated by wall switches, or radio frequency devices.The 5630 is perfect for ADA-compliant offices, classrooms and dorm rooms, and touch free applications like public restrooms, labs and examination rooms. This Norton 5610-PC is an electromechanical low energy door operator with power cord. The power cord will eliminate the use of a hard wiring operator. Just plug the cord into an electrical outlet. This operator is ideal for ADA compliant doors in classrooms, dormitories and offices, and for any doors in a touch-free environment. This Norton 5710-689 powermatic electrohydraulic pull side mount low energy operators for interior and exterior doors provide easy access for people with disabilities, the elderly or the frail. Designed primarily for manual opening applications that occasionally require automatic opening. This Norton 5730-689 is a powermatic low energy door operator for interior and exterior doors. The 5730 gets mounted on the push side of the door. Designed for simple installation in minutes. It is a reliable device that operates soundlessly and complies with ADA requirements. This Norton 6010 powermatic electrohydraulic low energy operators incorporate a door closer for smooth reliable door control. These low energy operators are for pull side mount on interior and exterior doors. Ideal for hospitals, office buildings, sports arenas or government facilities. This Norton 6030 is a push side mounted powermatic low energy door operator for interior and exterior doors is a heavy-duty unit designed for rigorous, high-use applications. This door operator is ANSI/BHMA A156.19 certified and it is ETL tested to UL/ULc standards for automatic doors used on fire and smoke barrier applications. This Norton 501 is a square activating door switch necessary for use with low energy operators which require an actuator for two-way traffic on both the interior and exterior side of the door. This Norton 502 is a square activating door switch that is stainless steel with a blue powder coat with white letters and the ADA symbol. This Norton 503 activating door switch fits on 1-3/4" frames narrow stile frames. This Norton 504 vestibule switches are for use in vestibule applications. This Norton 505 square activating door switch is for surface mount applications. This Norton 697 is a wall switch that requires no physical activation. Its Doppler radar sensor is activated through movement in the area. The Norton 536 single channel hand held transmitter works with the 539 radio frequency receiver for remote control of the door opening. This Norton 539 radio frequency receiver is for use with Norton Powermatic low energy operators for wireless door switches. Low energy operators require an actuator for two-way traffic on both the interior and exterior side of the door. The Norton 531 radio frequency wirless square activating door switch is for surface mount applications. The Norton 548 single channel transmitter works with the 539 radio frequency receiver to convert standard wall mount actuators to wireless for remote control of the door opening. The Wireless Interface Module ADA1028W allows the ADAEZ door operator to interface to ADAEZ wired or wireless push buttons, wireless remote, an electric lock, fire panel, access control, and an outside pushbutton disable contact.